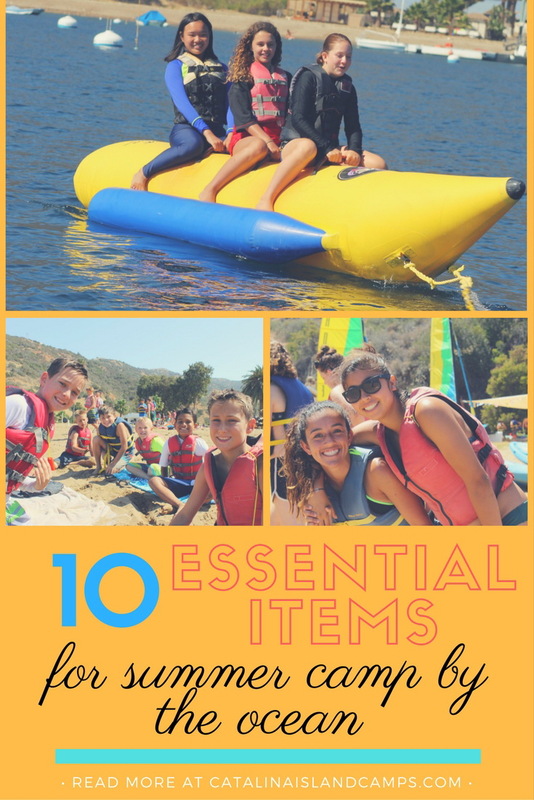 What do you need to pack for summer camp by the ocean? Here’s our go-to list! Lots and lots of sunscreen. The best type of sunscreen to buy is the type your child will use, and can use independently. Spray on, long lasting sunscreen are a parent/kid favorite. Look for non-sticky, sand and water friendly, high SPF versions. Colored zinc for noses and ears is a camp favorite. Powdered sunscreens can also be handy to have on hand for use on faces. Towels That Can Take a Beating. Thick expensive towels have no place at camp. Shop for inexpensive, thinner towels that dry quickly in the sun. Pack a few. Sneakers/Sport Shoes That Can Get Wet. Shoes that dry quickly, are a great choice for camp where shoes tend to get wet and muddy. Look for mesh, canvas and natural breathable materials. Sturdy Shower Shoes. Flip flops are essential for showering and beach activities, but flimsy flip flops tend to fall apart quickly. Shampoo/Bodywash Combo. 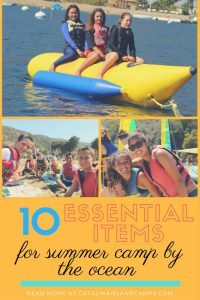 Especially for younger campers and boys, having one item to bring to the shower means there is less to lose and less to remember, which also means that they are more likely to actually get clean from head to toe. Buy the larger size. For kids with longer/courser hair, a spray on-leave in conditioner & detangler is a good idea, and can be left in the bunk for use outside the showers. Several Swim Suits. When you get in and out of the water several times a day for two weeks at an ocean summer camp, an extra swimsuit can be handy. Wear one to the showers to get the salt out and still have a dry one for an overcast early morning water-skiing.! A Hat with a Visor. Sun can be relentless at summer camp by the Ocean. Having a visor on your hat will give your eyes a break as well as keep the rays off your face. A Rashguard. Swim shirts can protect your back and shoulders from burning, especially in those areas where it is difficult to self apply sunscreen. Pack a couple for rotation. Sturdy Sunglasses. Sporty sunglasses with a neck leash for easy on and off (without losing them) are handy to have to protect your eyes from the rays. A Simple Waterproof Camera. This, while not strictly necessary, is a fun addition for shooting photos and capturing memories of camp, both in and out of the water. Be sure to label with your child’s name and consider purchasing/attaching a wrist strap with a flotation device. Want to learn ways camp benefits kids? Click here!